Please refer to our stock # 613 when inquiring. 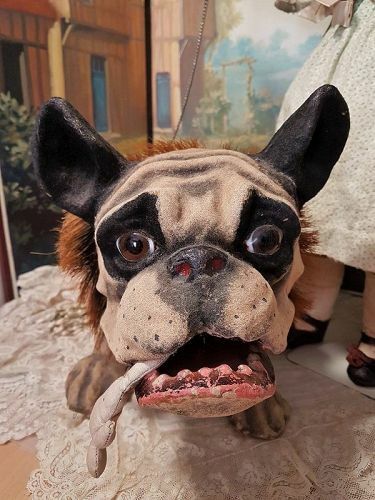 A special and charming friend for your French or German Doll an are to find antique English pull-toy bulldog from the 19th. century in generally rare excellent condition ! Circa 22 " ( 56 cm ) paper-mache bull dog with muscular shape who is posed in classic stance and with lovely loosely attached head designed to works up and down and from side to side. Has original flocked finish and open his mouth to growling if you pull the metal chain and show his strong teeth . Has pretty detail modeling of face with amber brown inset enamel glass eyes , modeled and painted nose , lovely stand up ears . Has defined tongue and well made strong teeth. The bull dog move with small hidden wheels under his legs when pulled buy the metal leash that is attached to his original leather collar and ruff. This dogs was a very popular toy in French Doll store for decades and is a rare find in this excellent condition at this times !! His little fabric doll belongs to him but my pretty French Jumeau girl is not included at this offer, thank you for understand !! Please let me know if you have any question or if you need more or special pictures and thank you for your interest on my Doll-Shop ! !